As is true with any historical event or founding of an institution, collectors of historical newspapers strive for the earliest reports possible. The Declaration of Independence first appeared in a newspaper on July 6, 1776, and that issue commands a six figure price much higher than printings of the document in other newspapers of later dates (such as the British Gentleman’s Magazine from August, 1776). Battle reports from the Revolutionary War are most coveted when in newspapers dated as close to the battle as possible. With the widespread use of the telegraph just before the Civil War, timeliness became less of an issue, as events would typically be found in the next day’s edition of newspapers regardless of how distance the printing press was from the event. With institutions, societies & organizations the collector strives for the earliest reports on their creation. Reports from the Continental Congress, the Constitutional Convention, the creation of military academy at West Point, the first baseball game mention, are just a few examples of icons of present-day societies which collectors like to find in newspaper reports dated as early as possible. Such is true with development of the Church of Jesus Christ of Latter-Day Saints, or the Mormons. Formally organized in upstate New York in 1829 accounts from that year or 1830 would rank among the most desired. Our earliest account was found in the ‘Christian Intelligencer” issue of February 4, 1831. As was typical with reporting of the day, bias, discrimination and prejudice were rampant within the newspaper pages, with the publisher’s mind-set not encumbered by political correctness. This early report notes that: “…the career of some fanatical individuals, who pretend to work miracles and to preach a new gospel. They profess to have discovered somewhere in New York a new revelation, hidden under a stone, which enables them to work miracles…a delusion and phrenzy with which these individual have wrought up the public mind…something like 500 adherents who follow those ignorant and deluded men with the same submission that sheep are led to slaughter…”. This intriguing report was likely the first its subscribers learned of this new religious movement,and with a current membership of over 14 million, this report dates to when just 500 were followers. A slightly later report in the popular ‘Niles’ Weekly Register‘ newspaper from Baltimore, July 16, 1831, shows a similar bias & prejudice: “…that certain knaves, pretending to have found some holy writings hidden under a stone…started a new religion! The leaders make bold pretensions and assert a gift to work miracles…now said to amount to 1,000 souls…some of whom…no doubt believe in all things that are told them…” and more. Newspaper accounts found in the 1831-1835 period were very few and remain among the most desired among collectors. By the time the leader Joseph Smith and the Mormons moved from Kirtland, Ohio, to Missouri and then Nauvoo, Illinois by 1839, reports in newspapers became more numerous, as their travels were often made dangerous by the suspicious locals who didn’t want them in their vicinity. 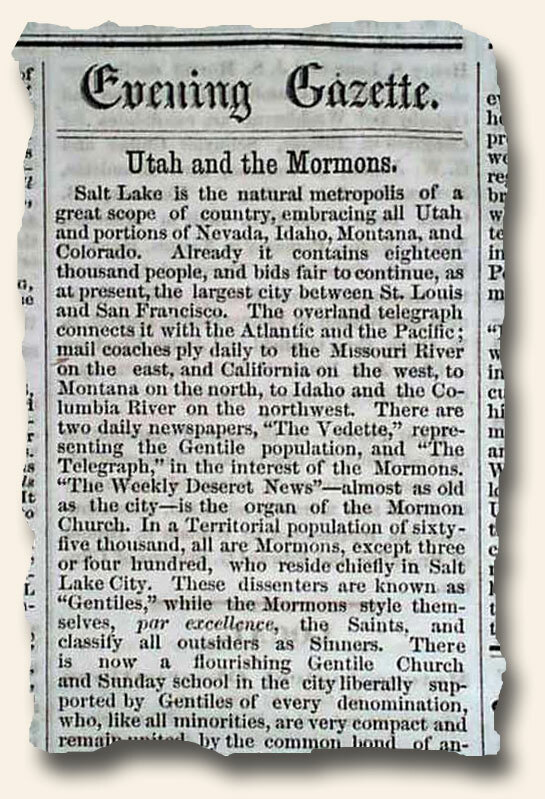 An interesting and desired collection of Mormon-related newspapers would include period reports of their movement westward, from New York to Ohio to Missouri to Illinois and ultimately to their own state of “Deseret” in the present-day state of Utah. With their arrival in 1847, Utah was not only not a state, it was not even a territorial possession. It was part of Mexico, but with the Treaty of Guadalupe Hidalgo which ended the Mexican War in 1848, it became a territory of the United States, and the disputes between the Mormons and the federal government would be legendary, the Mountain Meadows Massacre being among the most publicized. 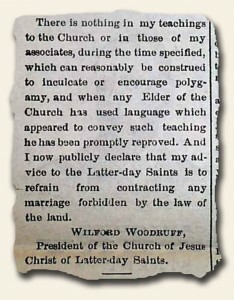 In additional to federal battles, disputes within their organization were quick to make the newspapers, and the practice of plural marriage did not set well with the typical Judeo-Christian ethic of the day. Typical of religious movements of the 19th century, the Mormons published several of their own periodicals, among the earliest and occasionally available being ‘Times & Seasons’ done during their turbulent stay in Nauvoo, Illinois. 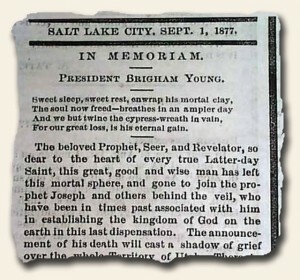 Within its pages was the report of the killing of founder and leader Joseph Smith. 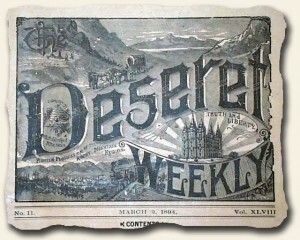 Other titles which occasionally surface for collectors are ‘The Latter-Day Saints’ ‘Millennial Star‘, the ‘Gospel Reflector’, and some three years after their arrival at Salt Lake City they set up the ‘Deseret News‘ in 1850, which was the first first newspaper to be published in present-day Utah, some 46 years before it would become a state. The fascinating and troublesome history of the Mormons and their trek across the frontier of America is now part & parcel of American history. Finding reports in newspapers from when they happened makes for an interesting segment of any rare newspaper collection.